Dee Caffari is known for facing adversity, taking on challenges and generally making things happen. From far corners of the globe, Dee communicates her passion and emotion to a wide audience and allows us all to experience a little of what she does, albeit from the comfort of our own armchair! It is this ability to communicate and share her passion that has connected Dee with Crew Clothing. Crew Clothing's brand philosophy is 'good times, good friends, good taste' which reflects Dee's outlook on life and is the reason she has become a brand ambassador for Crew Clothing during 2012. 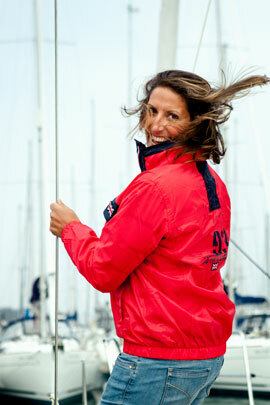 Crew Clothing Company was founded in 1993 by Alastair Parker-Swift. As a windsurfer and freestyle skier, he spotted an opportunity to fund his lifestyle by selling striped rugby shirts supporting the number 93, from a mate's storage lock up. It was from this enterprise that the Crew Clothing Company was born. The entrepreneurial spirit remains at the heart of the business today and Dee joins a number of Crew Mates that embody the brand philosophy and are proud of being supported by Crew Clothing. These include Olympic and Paralympic athletes and organisers as well as a TV wine expert and a seafood chef.